Gregory Waylande, Water, 1938, from the Fountain of the Atom, New York World’s Fair, 1939. Collection of Cranbrook Art Museum, partial gift of Patricia Shaw. Photography by R. H. Hensleigh and Tim Thayer. 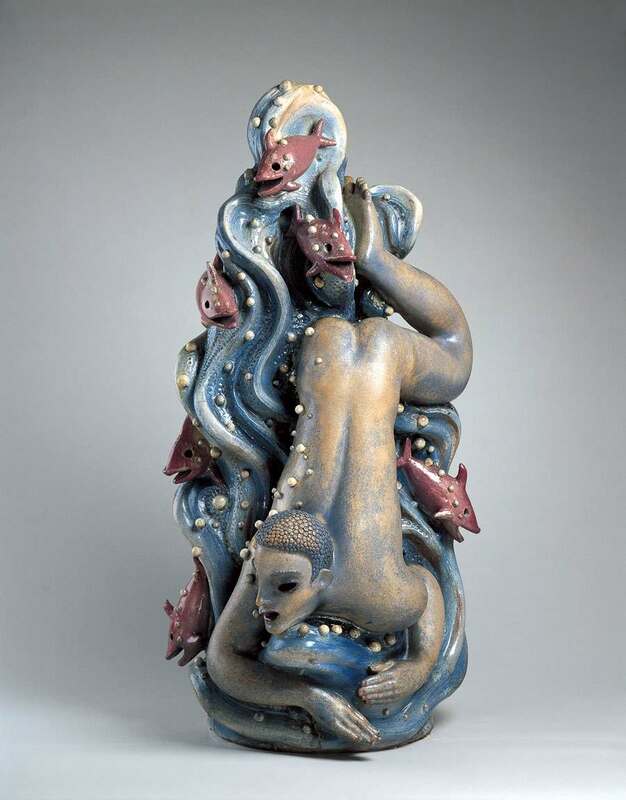 Waylande Gregory (1905-1971) redefined American ceramics in the 1930s and 1940s, creating monumental ceramic sculptures and helping to shape Art Deco design in the United States. Featuring over 60 works by the artist, Waylande Gregory: Art Deco Ceramics and the Atomic Impulse highlights Gregory’s role as the chief designer and lead sculptor at Cowan Pottery from 1928 to 1932, his brief but influential tenure as Resident Ceramic Sculptor at Cranbrook’s Arts and Crafts Studios (the earliest iteration of Cranbrook Academy of Art), and his work with the Works Progress Administration, an experience that served as the foundation for his groundbreaking Fountain of the Atom at the New York World’s Fair in 1939. With artwork from every stage of his career, the exhibition reunites sculptural pieces from the Fountain of the Atom, including Cranbrook Art Museum’s own Water sculpture. The staging of Waylande Gregory: Art Deco Ceramics at Cranbrook will include objects and archival material unique to Cranbrook and Gregory’s time at the institution. Waylande Gregory: Art Deco Ceramics and the Atomic Impulse was organized and circulated by the University of Richmond Museums, Virginia, and curated by independent ceramics scholar Dr. Thomas C. Folk. Support for the presentation of the exhibition at Cranbrook has been provided by Mr. and Mrs. Martin Stogniew, an anonymous donor, Mr. and Mrs. Jonathan J. Belding, Mr. Francis J. Brady, Dr. Thomas C. Folk, Mr. Gerald Maschino and Mrs. Shirley Wynne Maschino, and Richard Rossello Fine Arts Advisory Services, Inc. The exhibition is accompanied by a new monograph on the work of Waylande Gregory, which is available for purchase at Cranbrook Art Museum.